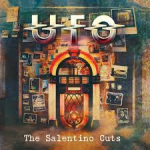 Share the post "Album review: UFO – The Salentino Cuts"
Originally formed in 1969, British rock legends have been rocking for nearly 50 years. With a brief hiatus or two, UFO have released 21 studio albums and some classic live sets along the way. This album is a much touted covers set sees many classic tracks given their take. Founder bassist Pete Way left the band a few years ago, and the band are famous for featuring guitar legend Michael Schenker on more than one occasion, as well as for a long string of wonderful and essential albums. The live album Strangers In The Night is pretty bloody good too. Alongside mainstay and vocalist Phil Mogg are long time drummer Andy Parker and keyboard player/guitarist Paul Raymond, guitarist Vinnie Moore (who joined in 2003) and bassist Rob De Luca (since 2012). This album also gives a good nod to some of the band’s roots. The album opens up with the Yardbirds’ ‘Heartful Of Soul’; Mogg’s vocals are still slick, solid, powerful, more than making up any (minor) loss of range. This song sounds just wonderful by UFO. ‘Break On Through (To The Other Side)’ is a solid cover, but I was never a Doors fan. The rich keyboards are appropriately turned up in the mix here, adding to the authenticity. Like the song or not, Mogg has the swagger. The Mad Seasons’ ‘River Of Deceit’ is a slower number and a nice change of pace, although it really isn’t in keeping with the UFO vibe. A move in the West Coast and Blues directions sees UFO tackle Steppenwolf’s ‘The Pusher’. Again not in keeping with what you associate with UFO but it is a better choice, and an excellent (and true) version of a great song. John Mellencamp’s ‘Paper In Fire’ is real UFO and it rocks. Some nice guitar touches rather than shred reliance make for a solid listen. ‘Rock Candy’, a track most will (or should) know, is a chunkier number given some great edges here. This one would fit in the live set smoothly. Another song right up the UFO street is Mountain’s ‘Mississippi Queen’, an earthy and honest rocker with blues tinges. A much covered song, Bill Withers’ ‘Ain’t No Sunshine’, suits UFO’s bluesier side well, and it’s smooth, but I’m not sure about Mogg’s vocals here; not that the range is an issue (it isn’t), he’s trying to something with his voice to suit the song that doesn’t come over so well. ‘Honey-Bee’ is a good solid deep number that has a dark edge, Mogg and crew do a fine job here. ‘Too Rolling Stoned’ – now we’re talking! A classic Robin Trower track that totally rocks and UFO do total justice too. The funky edge to Moore’s guitar fits perfectly. Likewise with the blues of ZZ Top’s ‘Just Got Paid’. Love it beginning to end. The album closes with ‘It’s My Life’, which sees the whole band shine. Some tracks work so much better than others, yes there are some strange choices but you’ll get that with any such album. It does sound like they had fun doing it. This entry was posted in ALBUM REVIEWS, ALBUM REVIEWS (Mobile), All Posts and tagged album, blues, classic songs, Covers, Montrose, Paul Raymond, Phil Mogg, review, rock, Rolling Stones, The Salentino Cuts, UFO, ZZ Top. Bookmark the permalink.